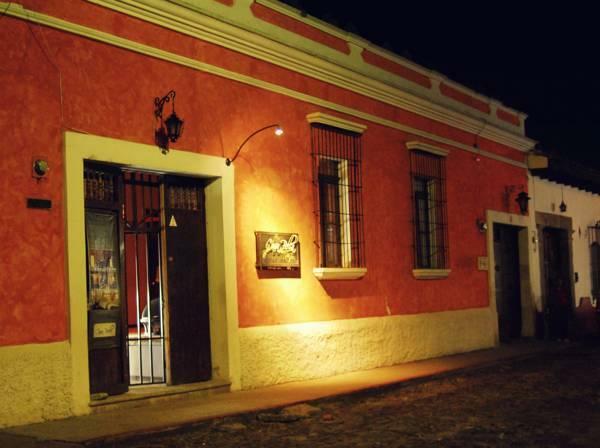 ﻿ Best Price on Casa Bella Boutique Hotel in Antigua Guatemala + Reviews! This charming boutique hotel is located in the heart of Antigua, just 2 blocks from Central Park. A free characteristic breakfast and elegant modern rooms with free WiFi, air conditioning, satelite TV and comfortable pillow-top beds are standard in each room Rooms at Casa Bella Boutique Hotel feature colonial and tropical-style décor. Each room has a plasma-screen satelite TV, full free WiFi access, mini-bars, fridge, fine bed linen, air conditioners and a bathroom with rain shower head. Suites are more spacious with King size beds and Jacuzzi. Free coffee and tea are offered anytime, light room service menu is available as well as romantic decorative packages. A small peaceful garden and lounge are available where guests can relax. Drinks and room service are available on request. Many attractions are a short walk away, including a number of Baroque churches. The Volcán de Agua Volcano is just 5 mi from the hotel and golf lovers will find La Reunion Golf Resort only 8.7 mi away. The hotel is 45 minutes’ drive from Guatemala City and La Aurora International Airport. Airport shuttles can be organized for an extra fee upon request. Parking is available close by. I loved this boutique hotel. Angelica at the front desk and the rest of the staff were very friendly and welcoming. My room was clean, bed was comfortable, warm water, great breakfast (included! ), well located. I would stay here again in a heart beat. I had a fantastic experience! The staff was not helpful in giving me the name of the shuttle service to and from airpot. They would not even take the information once I obtained it somewhere else and their explanation was that they work with a more expensive car service. The sheets were not clean, there were hair from previous sleeper in then and the hotel knew and they changed then without me asking. I don't think that the hotel interest goes beyond maximizing its profits and my disappointment is commensurate with the fact I got their best room which did not even have a table inside the suite de luxe. My wife and I had a delightful time. The staff were very friendly and helpful. The ambience of this small hotel was charming. It was centrally located and I was able to arrange it at the last minute with little if any problem on-line. Breakfast was tasty. The internal sitting areas were extensive and very pleastant considering the size of the hotel. my stay at Casa Bella Boutique was lovely, Angelica is the beautiful friendly receptionist who obviously enjoys her job as she was great to organise all that I required, I felt like I was leaving a best friend!! location and breakfast was also great.